Preheat oven to 350 degrees F. Grease and flour an 8x8-inch pan. Combine the oats, 3/4 cup flour, brown sugar, baking soda, and melted butter. Mix until uniform. Reserve 1 cup of this mix and press the remainder into the prepared pan. Combine the Dulce de Leche Sauce and 1 Tablespoon of flour. Spread mixture over the oatmeal crust. 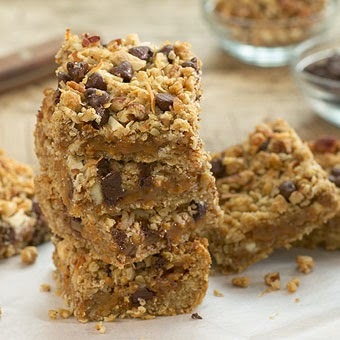 Combine the reserved oat mixture, pecans, white chocolate chunks, and semi-sweet chocolate chips. Spread over layer of Dulce de Leche. Bake for 30 minutes. Cool and cut into 2-inch squares.